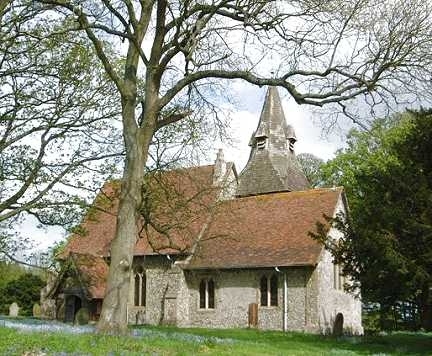 Lying high near the top of the Kent Downs ridge, Wichling is a quiet rural parish sitting astride the 'C' road from Ospringe in the north to Headcorn in the south. The A20 and the M20 are not far away, and the nearest station (2½ miles away) is at Lenham, on the Maidstone-Ashford line. The name is first recorded as Winchelesmere in Domesday Book in 1086, later as Wychelinge. The detailed etymology is uncertain, though 'mere' in 1086 meant a pool, and the suffix 'ing' mean 'the family of'. If there was a pool in 1086, it must have been a dew-pond, as the parish lies on chalk, which is permeable. There is no village, as such - just isolated farms and houses. The population has always been small - since 1800 always between 100 and 150. Even in 1890 the parish had no shops. The parish church of St Margaret lies attractively embowered in trees. From its churchyard, there are splendid views north towards the Isle of Sheppey, 12 miles away. A simple but appealing building, it dates from the 12th, 14th and 15th centuries. East Kent was in the front line during the crucial 1940 Battle of Britain, when the RAF successfully fought the Luftwaffe and averted the threat of Nazi invasion. Wichling's peace and quiet were then regularly disturbed by the dog-fights overhead. On one occasion, a German plane flying low over Doddington, the next parish to the northeast, came under rifle fire from Maori troops stationed in the village. Whether as a result of this or because it had run out of fuel, it came down in Wichling churchyard. Both aircraft and pilot were unscathed.